Andrew Zimmern serves up a recipe for Kulcha, a lesser-known Indian flatbread that's more versatile (and easier to make) than naan. 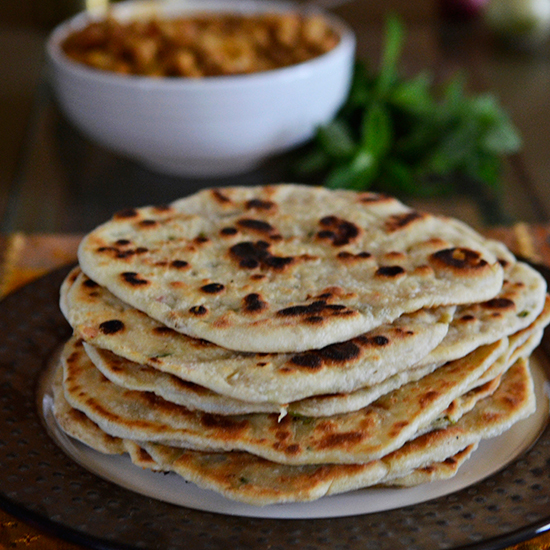 North Indian Punjabi flatbread is called kulcha. Kulcha is ideally served with spicy pulses, dals and (most famously) choley, which are spice-braised chickpeas. Naan has had its day in the sun, and it seemed last year I couldn’t open a book or magazine without seeing a recipe for it. Kulcha is less well known, but it’s easier and simpler to make because it doesn’t include yeast. Both breads are ideally made in a tandoor oven, but I make mine on a griddle on the stovetop or on a flattop on my wood-burning grill. If you develop the right touch, you can even make them using your broiler. I serve kulcha with everything you can think of: as a flatbread for shashlik (a form of shish kebab), for tacos al pastor, and rolled around grilled sausage with peppers and onions (my most recent favorite). Get the recipe.